In his recent decision in the case of Fratzola v. Klepadlo, No. 10 - CV -230 (C.P. Lacka. Co. August 7, 2012 Nealon, J. ), Judge Terrence R. Nealon of the Lackawanna County Court of Common Pleas addressed a request for sanctions against a Plaintiff in a motor vehicle accident case relative to the Plaintiff's failure to attend a scheduled independent medical examination (IME). In this matter, the Plaintiff had been given the wrong address for the IME doctor by his own attorney. The Plaintiff called his attorney and continued on to the IME doctor's office but arrived late for his appointment. The doctor was allegedly unable to accommodate the Plaintiff and the IME did not take place. When the Defendants were hit with a forfeiture fee by the IME doctor, the Defendants filed a Motion for Sanctions requesting the sanction of having the Plaintiff pay the forfeiture fee. In the meantime, during the pendency of the motion for sanctions, the IME had been rescheduled in the case. However, when the Plaintiff arrived for the second scheduled IME he was told by the doctor that the IME had been cancelled. The IME was again rescheduled for a third time and is currently set to take place in September. 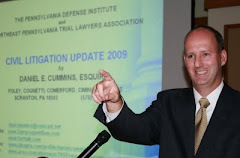 The Lackawanna County Discovery Master first heard the issue and granted partial relief to the Defendants by ordering the Plaintiff to pay a portion of the IME forfeiture fee. The Plaintiff filed a de novo appeal and the case was argued before Judge Nealon. In his Opinion, Judge Nealon reviewed the issue under the factors pertinent to the analysis for discovery sanctions and found that sanctions were not warranted. In his Opinion, Judge Nealon emphasized that the Plaintiff had not acted in bad faith and that there was no prejudice to the Defendant's defense since the IME was still in line to take place. Accordingly, the court reversed the Order of sanctions issued by the Discovery Master and denied the Motion.